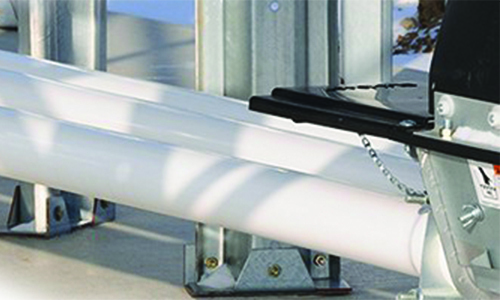 Nothing beats the Flex-Flo™ Feed Delivery System in flexibility and adaptability. This system adapts to a variety of configurations and capacities to meet today’s demanding production requirements. We use polyvinyl chloride (PVC) tubing which is extruded and formed in our own facility, to exacting standards and under our own quality control. Blended PVC allows us to formulate the optimum compound for UV stabilization, strength and wear resistance. Using PVC tubing as the carrier of feed not only provides flexibility in facility design, but reduces dust, provides protection against insect and rodent contamination, and reduces stressful operation noise. 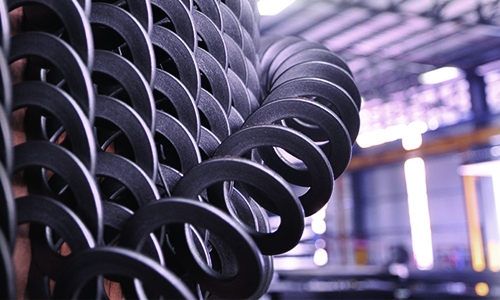 Our augers are coiled in-house from high tensile steel for consistent quality and strength. 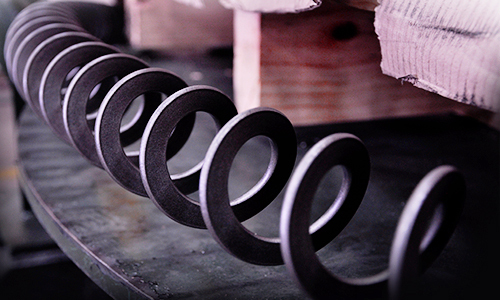 We use wire which is flattened prior to hardening which provides better resistance to distortion and an all-around stronger product. For moving feed up in the air and around corners, our Flex-Flo™ tubing is available in specially formed elbows with increased wall thickness on the inside of the elbow for added strength and wear resistance. Both tubing and augers are available in a variety of models to fit your specific requirements. Whether its ground feed, mash, high moisture corn, shelled corn or pellets, we have the transport system combinations to handle it. For corn up to 27% moisture and other hard to flow materials, the Flex-Flo High Roughage system utilizes a combination of a Model 300 (75mm) auger in a Model 350 (90mm) tube. For pelleted feeds, a specially designed auger is available for Model 300 Flex-Flo, which increases the tolerance between the tube wall and auger. 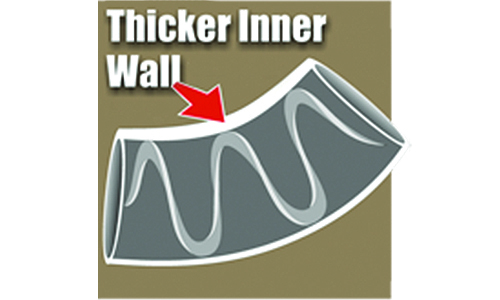 This increased tolerance prevents auger plugging and damage to expensive pelleted feeds.